Miss Malini Addressed Armaan As Amaal Malik, Singer Neha Bhasin Lashes Out For Being Disrepectful! Bollywood blogger Miss Malini has surrounded herself with a controversy after she misnamed singer Armaan as Amaal Malik while posting a video on Twitter from IIFA 2017. 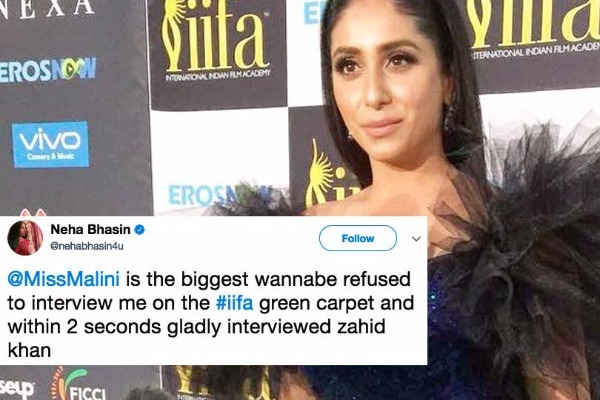 Soon after this blunder, singer Neha Bhasin publicly exposed Miss Malini for giving her cold shoulder at IIFA 2017 green carpet. She mis-mentioned Armaan as Amaal Malik. However, Amaal Malik was quick to correct the blogger. Later singer Aditi Singh Sharma replied to Amaal’s tweet confession how Miss Malini once addressed her as Kanika Kapoor adding how musicians are ignored. And then singer Neha Bhasin replied to Aditi Sharma’s tweet and confessed the Malini refused to interview her at IIFA 2017 green carpet. She even addressed Miss Malini as the biggest wannabe. Neha Bhasin had a bang on reaction to Malini’s proposal on coming at the office for the interview. Respect to Neha Bhasin for coming out publicly and speaking on behalf of all the singers. You go, girl!